Oktoberfest is celebrated in Germany from late September into early October. I always forget about it until we are well into October. I figure we Americans can celebrate in October since we are not clued into the German schedule very much. I only remember it when I see ads for beer and restaurants talking about Oktoberfest. Here are some fairly authentic recipes to try for great flavor anytime. 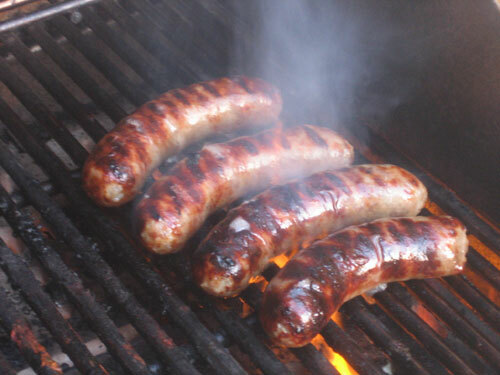 Here is the # 1 recipe for brats at AllRecipes. Reviewers say to use a strong flavored dark beer to cook the brats in and to prick them with a fork to get more of the beer flavor to sink in. That also lets some of the fat out, so you get a leaner brat to eat. Grilling the brats finishes them off to perfection. Serve in good buns with sauerkraut or a mixture of sauteed onions and peppers. Or just some good mustard. And beer. 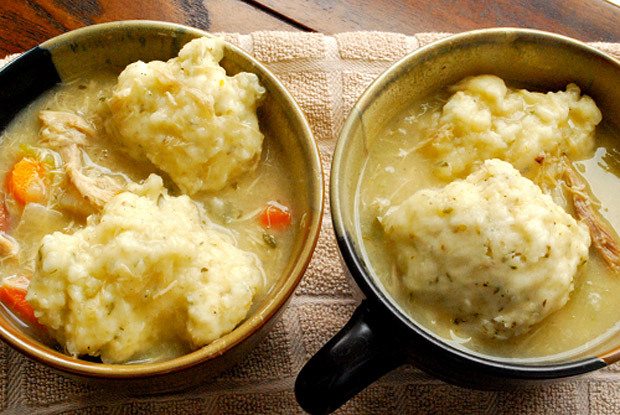 Germans are known for their frugality and they make dumplings from bread. Reviewers praise these as being authentic German dumplings. The spices are just right for the real thing. Serve these as a side dish to any meat or fish entree. I like them in a good beef stew or in any soup. Real comfort food. This is popular all over the US already, and it’s a great combination with those beer brats. It’s really good, really cheap, and has that authentic Oktoberfest flavor with plenty of bacon. It uses vinegar instead of high fat mayonnaise. Click here for the recipe and some great hints to make this really yummy. 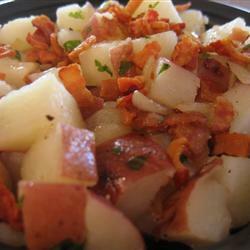 The dressing for the potato salad can also be used to make a German style “wilted salad” by pouring the hot dressing onto greens. Yes, the German immigrants to Texas probably brought this recipe with them. 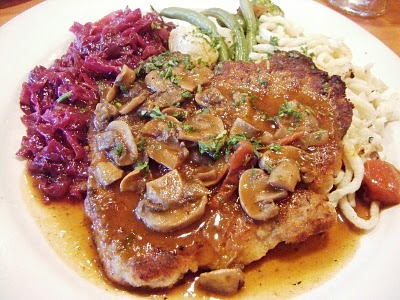 This recipe is for breaded pork, but the technique can be used in making chicken or beef. Add plenty of sauteed mushrooms to the gravy for extra goodness. Serve with any kind of potatoes or noodles to use all that wonderful gravy. Click here for the recipe at AllRecipes. Open a jar of sweet and sour red cabbage as pictured and you have a fantastic Oktoberfest meal. To make these authentic beef roll-ups, use beef flank steak, an inexpensive lean cut. Roll up the steak around bacon, pickle slices and onions, tie them with string, then saute the beef roll-ups in butter. You’d think that would be enough flavor, but no. They get simmered in beef broth and served in a sour cream gravy. Wow. That’s not exactly a quick recipe, but it’s not difficult either. Serve the rolls on good noodles with a side of cooked carrots if you like. Click here for this very popular recipe at AllRecipes. I can’t forget a good apple dessert. 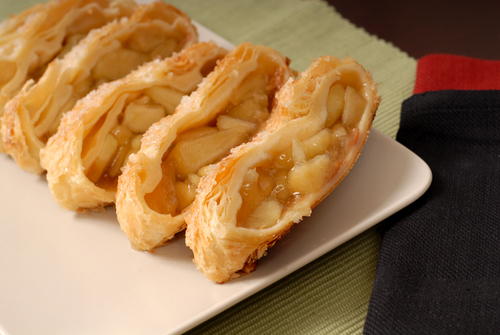 This apple strudel is actually easy to make and inexpensive. I’d add a few nuts to the apple/raisin mixture. Those apple pies at fast food restaurants remind me of this, but this is so much better. Wonderful with a good cup of coffee. Wish I had some right now. It’s hard to say which country came up with strudel (puff pastry around fruit), but the Viennese and the Danish were famous for their pastries. Not to mention the French. I have a feeling something this yummy was/is made all over Europe. This gorgeous cake can be made the original way or a quick way with a box mix. The flavors are fantastic and the presentation is show-stopping. Here is the link to my tips for this recipe. It’s one of the most popular posts of all time here at Square Pennies. It’s wonderful for any holiday or special occasion. Highly recommended! Ah, yes, strudel is to dream of. At least it’s easy to make! I’m liking your idea to freeze roladen in meal size portions. Smart! 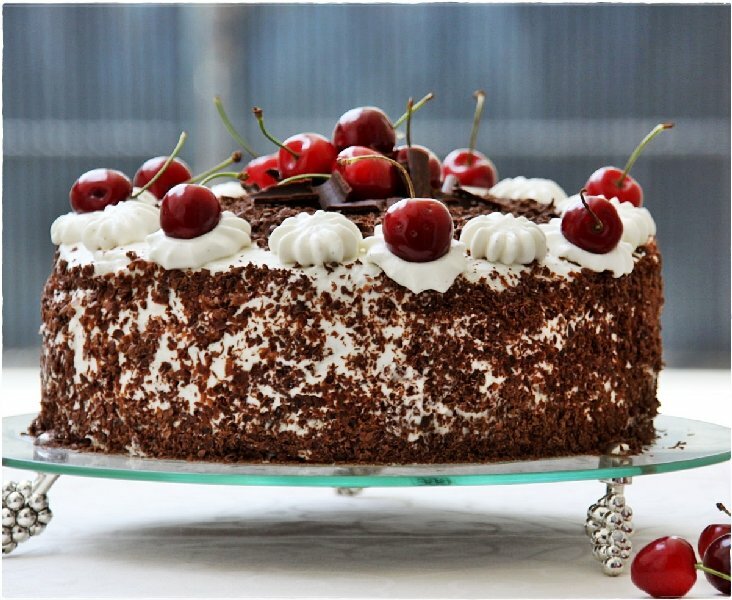 I do love Black Forest Cake, but my fave from this list has to be the brats. We buy really lean brats from a butcher and they are to die for. Much better than anything I’ve had even at festivals. They are so good you don’t even need sauerkraut, just a bun! Your post is making me hungry Maggie! With our German background we make pretty much everything on here. We can easily spend a whole afternoon making Roladen. Then we freeze them in meal size packs for whenever we want them. I also love German Potato salad and of course Black Forest Cake. I’ve never attempted to make the cake. We usually buy a slice to share from a local German Deli.